Bring lentils to a boil with cold water to start. Strain and rinse off the lentils. Cook the peas in salted water for 30 seconds and shock them in ice water. Put peas back into sauce pan with veggie stock, shallot, carrot and celery. Cook until tender, then add salt to season at the end. Remove vegetables from the lentils, but let lentils cool down in broth. Take sauté pan and place lentils with just a few tablespoons of broth. Next, bring lentils to a boil, then reduce flame into low heat. Add butter little by little, stirring continuously. Add the peas, olive oil and probably a little more broth to obtain a perfect smooth emulsion. Check seasoning. 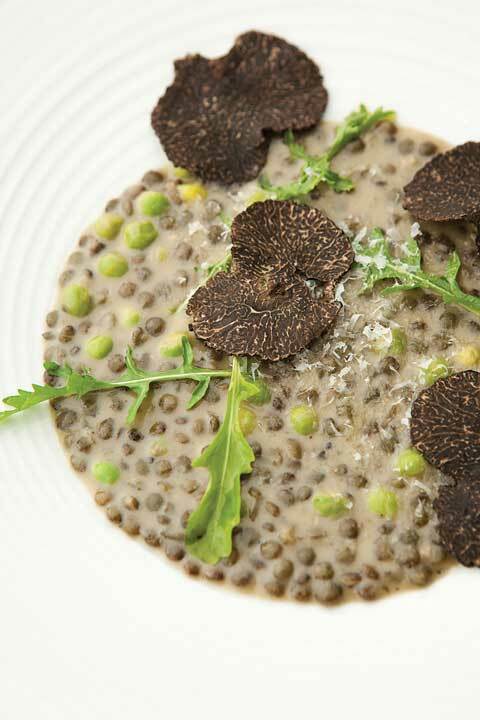 Place lentils in a deep platter or six separate plates and finish dish with grated cheese, arugula and freshly shaved black truffle.